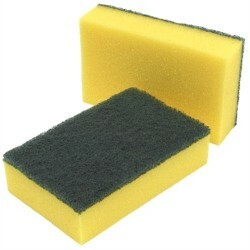 We have a few diffferent types of scourers that we are sure will help get the job done ou need. Feel free to call or email for any hlp at all where our staff will be happy to help. Large catering size, 5 " x 3 "Ideal for heavy duty applications.. Available in small or large. Removes burnt on stains with ease. Ideal for grill pans and BBQs. Avail..
9 " good quality heavy scourers. Catering quality. Trade Top Up quantities 20 x 10..
Copper scourer reduces risk of scratching more delicate surfacesA circular scourer made from fine me..